Everyone should pay at least one visit to this venerable Fleet Street landmark. It’s one of the oldest pubs in the city (rebuilt not long after the Great Fire of 1666, and still today occupying the same labyrinth of seemingly random rooms connected by higgledy-piggledy passageways). The tourists love it, naturally, for its manifest antiquity and its literary connections: Charles Dickens and PG Wodehouse are just two of those who frequented these dimly lit rooms. Today you can follow their lead for nothing more than the price of a pint of Sam Smith’s beer, and perhaps a meal in the chop room if you fancy some basic pub grub. Stopped in on a chill autumn eve. It's a film set. Incredible. The beers are excellent too. Despite Fleet Street being so busy it was so quiet in there. Only the tick tock of the big clock above the door and the crackle of the burning wood on the fire. Bring a headtorch though ;). So dark it's Impossible to count your change! Worst management EVER. Will not go back again. This is the perfect pub to take visitors to London. It is located off the famous Fleet Street (Sweeny Todd, anyone? ), tucked away down a very old looking alley, and was frequented by many famous writers including Charles Dickens, GK Chesterton, and Mark Twain. When you walk into the pub, on the immediate the right there is a little bar with a stuffed parrot on the mantel (apparently used to be the old owner's pet) but keep going and take a left down the narrow stairway to explore a beehive of different rooms for libations. It is extremely crowded on weekends, so I recommend going on a weekday. This is a wonderful 'ye olde' pub with lots of nooks and crannies to hide away in and enjoy a beverage or two. Situated on Fleet Street, it is often very busy, especially in the evenings, and is used by local workers and tourists alike. Currently operated by Sam Smiths, the choice of draught beers/ales come from their own brewery and there are a number of bottled, stronger beers too. The prices for beers/ales is very reasonable, especially for London, but the wine is rather overpriced for the quality that you receive, especially as there is a lack of any real choice. The food isn’t the best but it is ok and the menu is very similar to other Sam Smiths pubs. I find the staff are always friendly but are rushed off their feet so often won’t engage in any sort of conversation as they just don’t have time. 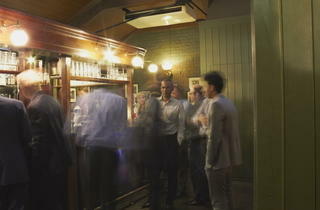 This is a lovely old pub with a fantastic atmosphere, it’s always comfortably busy. Service isn’t amazing but it is efficient. The selection of drinks is what you would expect, however the food is quite poor quality. The pies are obviously mass bought and stuck in the oven and veg is clearly microwaved. It’s a shame as really good pub grub is what you expect from such an institute. I’d recommend it for a drink in the area though. I liked this cosy and historic pub a lot! It has all the fabulous features that you'd expect from Ye Olde Pub, multiple rabbit warren-esque rooms, low ceilings, dark corners and steep staircases. They serve lovely pub food (no Kale here kids) and have bar snacks including Pork Pies - which were excellent. With lots of drinks on offer and plenty of beer choices, I will be coming back to this fine establishment! It's a popular choice for tourist groups so don't be surprised if you see people in historical dress - and hey why not! It is definitely an experience here. Go during the winter, and on a quiet evening and you'll find a gorgeous little drinking hole that could nearly convince you that you are in the Dickensian era. Cheap ish drinks and good food make this is very goo choice when it's quiet and colder. Go on a summer day during the weekend and you may just find it to be too busy, too warm, an odd aroma, and much too dark. What is charming when it's cooler turns oppressively muggy during the warmer months. And when it's rammed it's completely rammed and you can spend quite a while wandering around trying to get a seat. Definitely go, but don't expect it to be a perfect visit. Full of tourists, but I love the place. 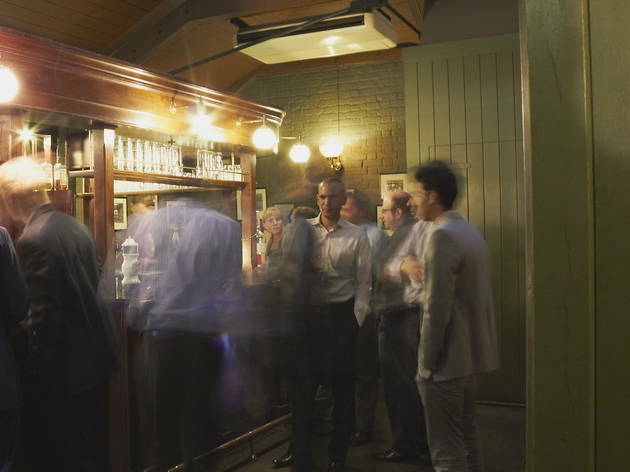 You have to go to Ye Olde Cheshire Cheese if you are anywhere near Fleet Street. You can tell it's old as the ceilings and staircases are pretty low and windy and definitely don't expect any phone signal the further you venture in, but it's all worth it. Samuel Smiths know how to keep the character of a pub and this place is no exception. A very popular spot for those in the know, you can enjoy a pint with friends knowing that you won't be found by the outside world if you don't want to be, which is quite nice these days. I agree with Enn C. - it is literally the worst pub management I've ever come across. Not only did I witness the rudest treatment of a customer I've ever seen, but I then saw a member of staff treated in a similar fashion. An unpleasant experience.There are plenty of other historic pubs in London and I now frequent them instead. A place like this where you can hide an entire party without it being generally known that they are there is a diamond among pubs, it should be more widely known that “party people” can wet their whistles there with impunity. Amazing pub, you can't visit London and not have a swift wheat beer in the Cheshire Cheese. Unique.